First things first, apparently it is pronounced “Live Grit” with a short i as in “live free” not a long i as in “live wire,” just fyi. I only learned that from the emcee at the race. I got to the race start at Montrose Ave and Simonds Drive at just after 7 am. I took the red line in to the Wilson stop, which means I walked about a mile to the race tents. Was nice though- I had plenty of time to eat my banana, and the walk was a nice warm-up. I did notice that there seemed to be plenty of parking (at 7 am at least), so maybe next time I’d drive in instead of the super long L commute. The weather for the 2015 Live Grit Lakefront 10 Miler was pretty perfect, just under 60 and sunny for the 8 am start time. 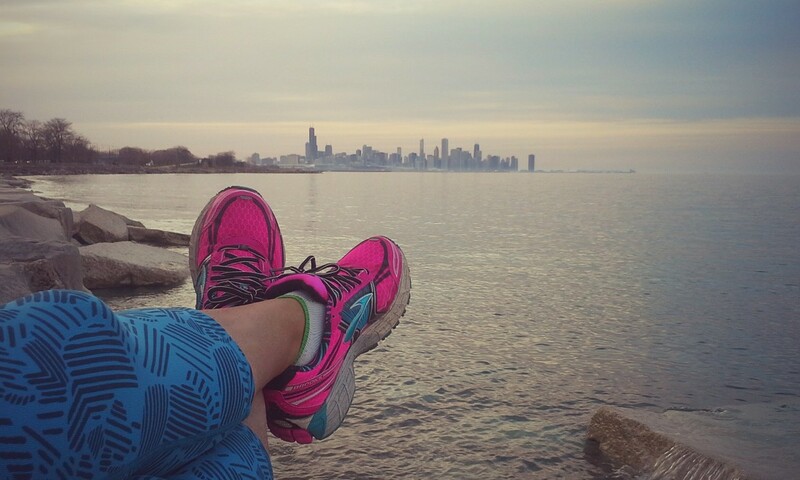 I took the panorama above while hanging out on the lakefront waiting for the race to start. This race was the first one I ran on my own since my race buddies were all out of town. I really liked running it on my own though, as it was just a nice and quiet, relaxing morning by myself. 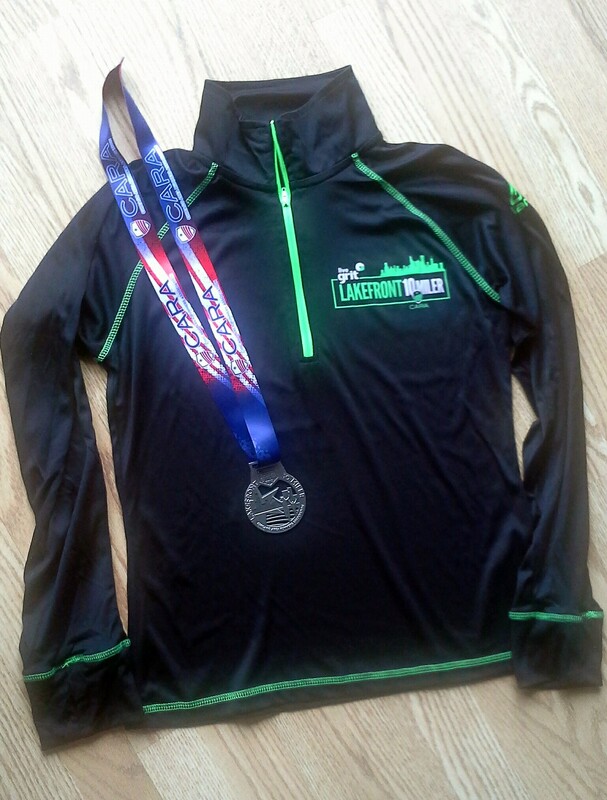 2015 Live Grit Lakefront 10 Miler long sleeve technical shirt with thumbholes (I got a Womens' small- it's a bit short in the torso and arms, so could have gotten a medium but small still works) and really nice medal. I picked up my race packet at the Live Grit store the Friday evening before the race. 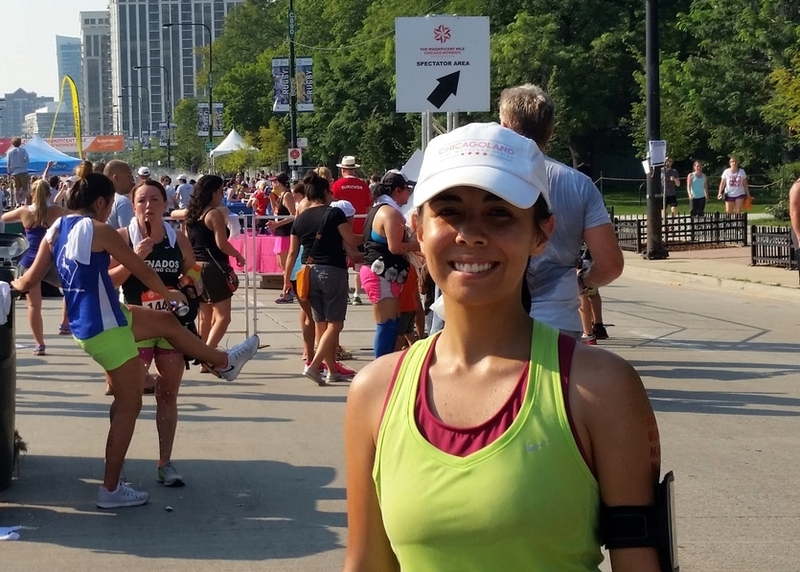 The race registration cost was $65 non-early bird and non-CARA member (but I had a 20% discount for working in UChicago Medicine). The packet included a long-sleeved shirt made by Alanic shown in the pic above and some freebie protein shake samples. The event bag was a “virtual bag,” with some coupons and fliers, etc. This year there were 1,115 people who finished the race, 581 of whom were women (52%). This was the smallest of the three races I have run, which was great. There was no line for gear check (which I needed since I ran by myself) and short lines only for the port-o-potties (no line at all at 7:15 am). This was also the first CARA affiliated race that I’ve done. Everything ran smoothly, and there were even clocks at every mile marker, which was nice. 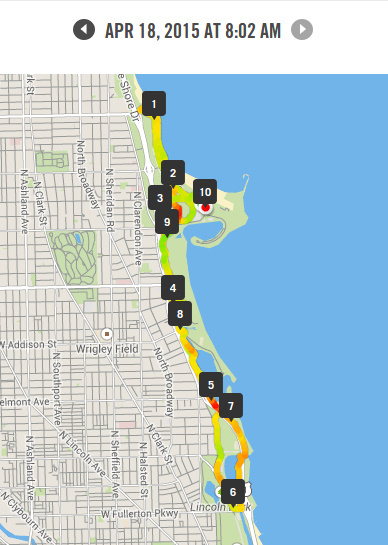 The course ran up and down the lakefront trail, partially over some big grassy hill thing, and partially on the same route we ran for the Chi Town half marathon, I think. I’m not sure if any splits were clocked, but I slowed down a lot (> 11’ pace) for miles 6-8 because of a bad head wind. It was blowing hard in my face so my eyes were watering, and I had to stop a few times since it was hard to breathe regularly. Live Grit Lakefront 10 Miler course map. I decided that since I just ran a half marathon two weeks before this race, I’d just shoot for an easy-ish attainable 11’ minute pace for a goal finish time of 1:50:00, and anything faster than that would just be icing on the cake if I felt good. I finished with a 10:48’ finish for a time of 1:48:01, comfortably under my target but slower than my half marathon pace. Fine for me. 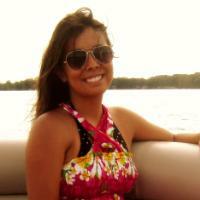 So I should probably rename this blog “Running below average.” I guess these CARA runners are fast! After the race, I got some gatorade and a chocolate chip cookie, picked up my bag from gear check, then headed over to the Lagunitas area to trade in my drink coupon for a Lagunitas “Runner’s High-P-A” (they also had a Pilsener), which I drank while stretching out my legs a bit. Great to have some good beer at the post-race party. Enjoying my Runner's High-P-A from Lagunitas. After my beer, I walked around the other tents- got a great little lunch box cooler and a hot and cold pack from the UChicago medicine tent and also some samples from the Clif bar tent. Then I grabbed a bagel for the mile walk back to the red line station. And a Five Guys bacon cheeseburger and fries on my way home. Muaw hahaha, earned it!!! Great race! 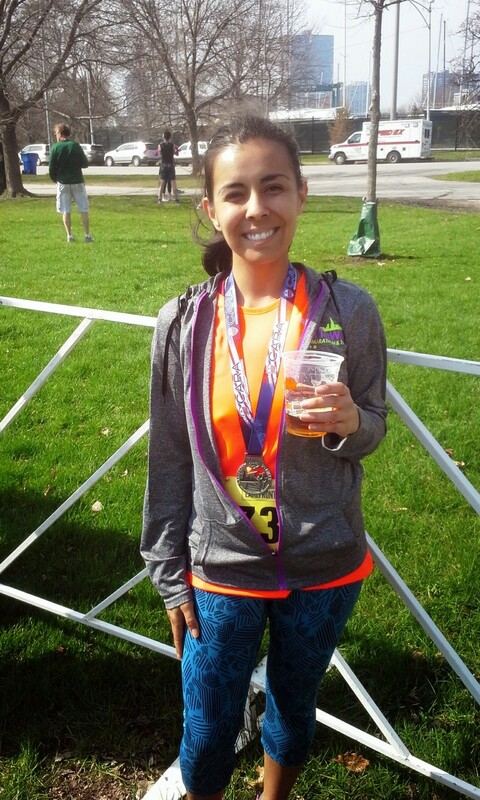 Perfect weather, really nice to run on my own, and really nice to run a smaller sized race. The medal is the nicest of the three I have so far, if you’re motivated by that (I am). Also, I really like the 10 mile distance- it feels like a legit distance, but not overly long. I was really glad to not have another 5k to run at the end. I’d gladly run this race again next year, and if so I’ll probably join CARA beforehand.